Price trends deliver competitive boost and optimism for 2017. Cheese price trends have been working in favor of U.S. suppliers for nearly two quarters, and markets suggest more of the same in the months ahead. Recent price shifts support U.S. competitiveness, but time will tell whether that edge helps deliver export gains. From a price standpoint, the previous two-plus years have been difficult on U.S. cheese suppliers. From August 2014 through September 2016, except for a handful of months, U.S. cheddar ran at a significant premium to EU and Oceania cheese. On average, over that period, the AMS survey U.S. cheddar price was US$366/ton higher than indicative EU cheddar prices and US$575/ton more than indicative Oceania cheddar prices. It dipped below EU prices for a three-month span in 2015, but never dropped under the Oceania price. Since October 2016, pricing has been more inconsistent but on the whole moving in the U.S. favor. From October through early March 2017, EU cheddar averaged $106/ton a more than U.S. cheese. Since the start of 2017, Oceania cheddar has grown more expensive than U.S. cheese by the month, with the gap rising from $69/a ton in January to $243/ton through mid-March. If using a mobile device, the following chart is best viewed horizontally in landscape mode. Interactive charts: Go to our market information section, where you can drill down interactively for granular data based on specific dates, exporters and more. Charts like the one shown above can be created in the market information/prices section. 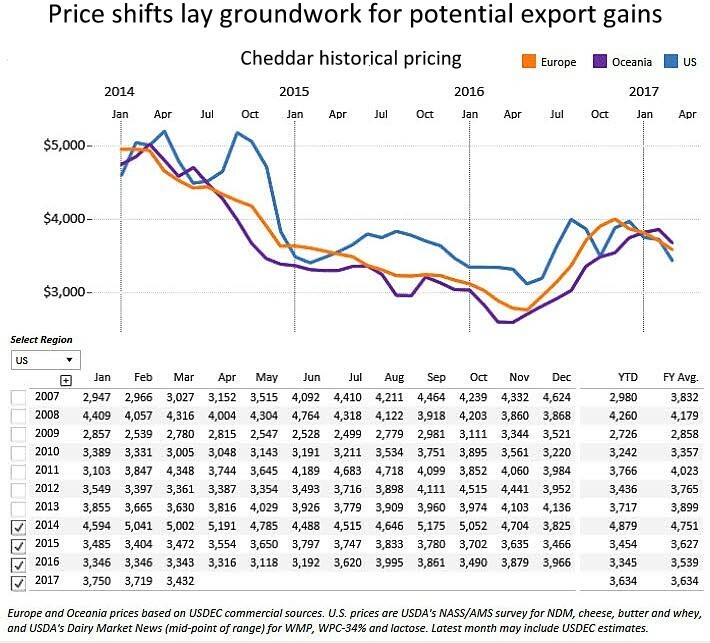 It’s too early to speculate whether the price shifts will help deliver sustainable growth for U.S. cheese exports. And many additional factors influence cheese sales. But these are positive signs. Since prices began to tighten late last summer, U.S. cheese appears to have found more solid global footing. For the last quarter of 2016, U.S. cheese exports rose 14 percent compared to the previous year. In January, despite double-digit year-over-year declines to Mexico and Japan (the No. 1 and 3 U.S. cheese markets, respectively), overall U.S. cheese volume rose 3 percent. Broad demand for U.S. product in South Korea, Canada, Central America, Oceania, Southeast Asia and elsewhere—indicative of steadily rising global cheese consumption—helped deliver the gain. In its latest World Agricultural Supply and Demand Estimates report, USDA reduced its 2017 U.S. cheese price forecast citing high U.S. stocks. While that does not guarantee the United States will maintain a pricing advantage, it does suggest U.S. suppliers are likely to remain more price competitive in the months ahead than they have been over the past couple years. Should the United States hold the price edge, recent history provides some cause for export optimism: The last two times U.S. cheese prices ran less than EU and Oceania prices for the calendar year were 2010 and 2013. Those two years also marked the two largest annual single-year volume gains for U.S. cheese exports. Editor's note: This analysis is based on data available on March 21.